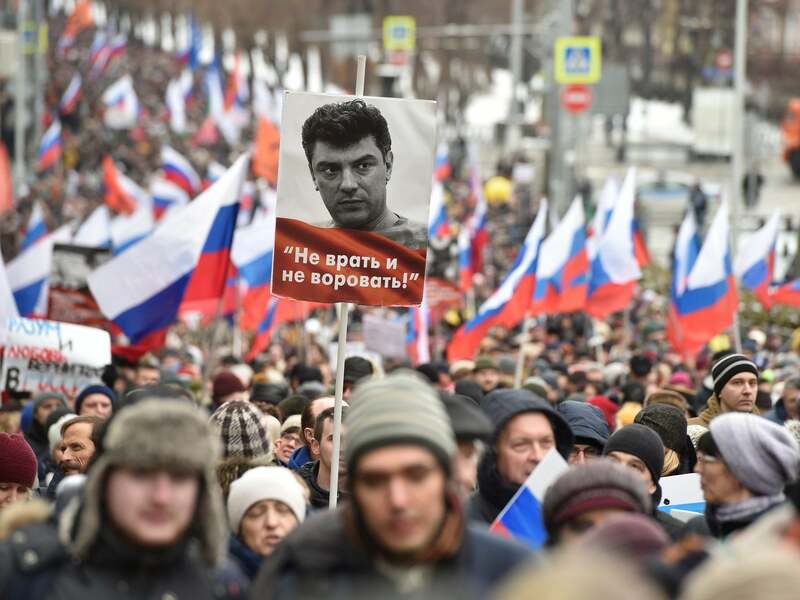 Thousands of Russian protesters gathered in Moscow against President Vladimir Putin and honored the memory of opposition leader Boris Nemtsov. “This is a lot of opposition to Vladimir Putin. This is for a free and democratic Russia, "one of the event's organizers, politician Ilya Yashin, said in a video prior to the march. Nemtsov, an ardent critic of Mr Putin, was shot dead on February 27, 2015, as he crossed a bridge near the Kremlin. The 55-year-old was working on a report investigating Russia's role in the conflict in Ukraine. His death sent a chill throu gh opposition circles and deprived Russians opposed to President Putin of a charismatic and energetic leader. Activist Nataliya Gryaznyevich said that "Nemtsov was a very colorful political figure". She said his death "left an empty hole in politics". Alexei Navalny, another critic of Mr Putin, was also present at the rally. Last year, Washington DC renamed the street outside the Russian embassy after Nemtsov. In 2017, an officer in the security forces of Chechnya's Kremlin-backed leader Ramzan Kadyrov was convicted of killing Nemtsov and jailed for 20 years. Four others were convicted of being involved in the murder and handed terms between 11 and 19 years. At the time, the late politician allies said the investigation had been covered and that had ordered his assassination. At The Independent no one tells us what to write. That's why, in an era of political lies and Brexit bias, more readers are turning to an independent source. Subscribe from just 15p a day for extra exclusives, events and ebooks – all with no ads.